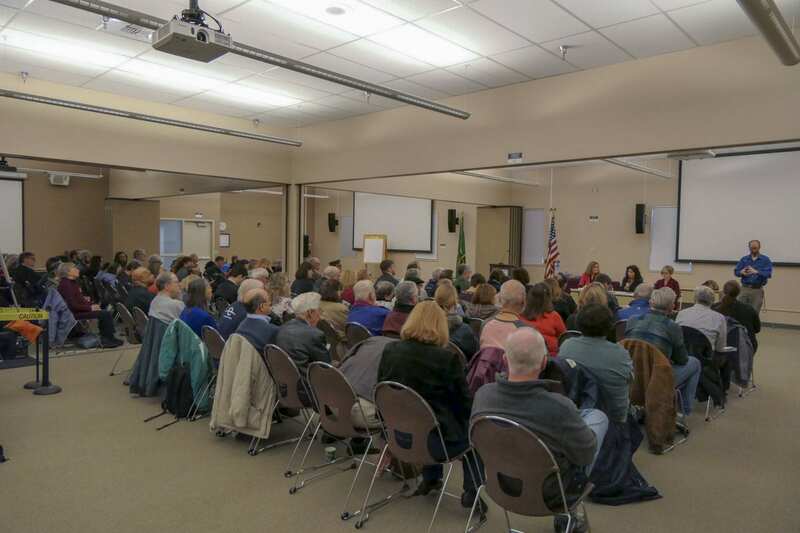 VANCOUVER — As has become their habit, the members of Southwest Washington’s 49th Legislative District gathered ahead of the legislature’s long session for a town hall meeting with constituents. The group also regularly holds post-session town hall meetings, and said they would attempt to at least hold telephone town halls during the 105-day session. Several hundred people crowded into the ESD 112 building on a recent Saturday morning to submit their questions in writing for the 49th District representatives, who went through several dozen during the two hour session. The education funding crisis, transportation, and healthcare factored heavily into the discussion. While Republicans currently fill all seats in the 17th and 18th Districts, the 49th is represented by Democrats. Representatives Sharon Wylie and Monica Stonier are entering their fourth and second terms respectively. Stonier previously represented the 17th District for one term before being unseated by Lynda Wilson in 2014. Neither faced any opponent in the 2018 primary or general elections. Sen. Annette Cleveland is in the midst of her second term, and will be chair of the senate Healthcare Committee. She also serves on the Transportation Committee, and the Rules Committee. This year she will also serve on the Human Services Committee. Though she’s just in her second term for the 49th District, Stonier is moving quickly up the ranks in the House. This year she will be Majority Floor Leader, though she says she had to give up her vice chair position of the House Education Committee in order to take on that leadership role. Stonier, who works as an instructional coach for paraeducators in the Evergreen School District, played a key role in creating the McCleary funding fix during the past two legislative sessions. Wylie will be vice chair of the House Transportation Committee, along with serving on the bi-state Transportation Committee formed to work with Oregon on restarting the I-5 Bridge replacement conversation. Stonier is also on that committee, which is chaired by Cleveland. Wylie will also serve on the House Finance Committee, along with the Committee on Innovation, Technology, and Economic Development. 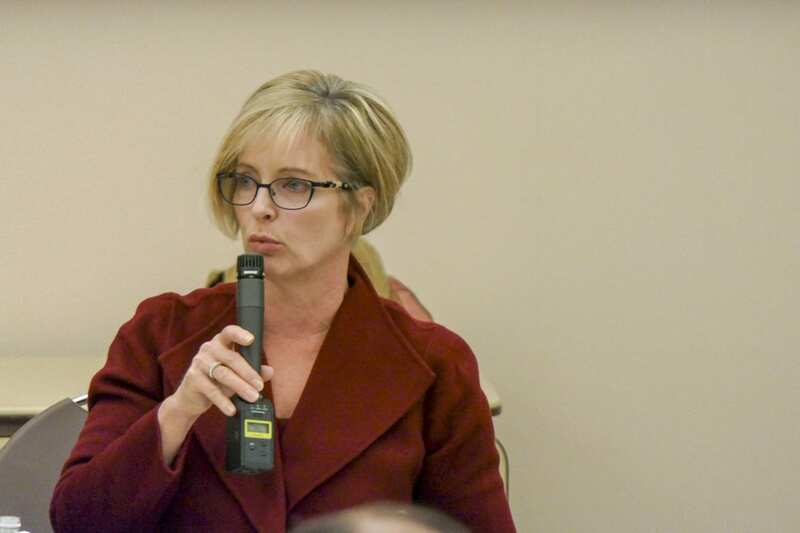 Although we’ve already gone into some depth on what local lawmakers have to say about the school budget issue here, the 49th District legislators also addressed some of the changes they would like to see in the way the state funds basic education. Stonier said she voted for the final McCleary bill, but was not in favor of the move to eliminate the statewide salary schedule. 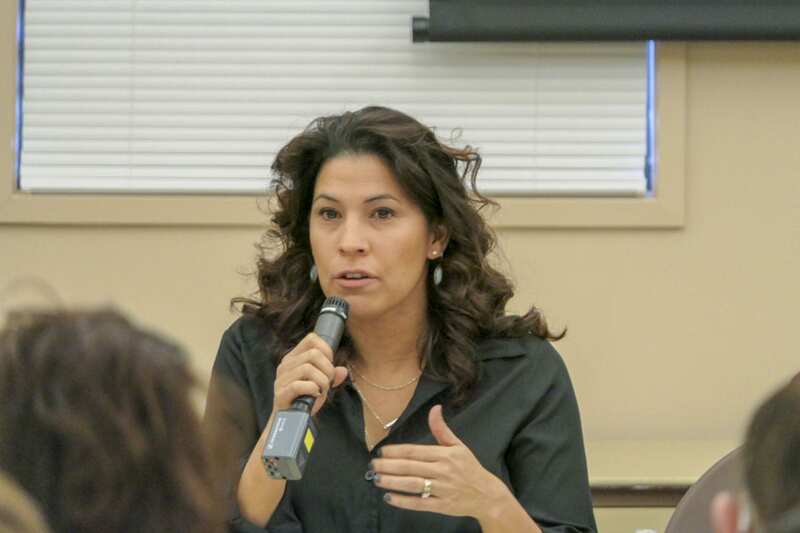 “If we had maintained a state salary schedule, I think that would have helped even out some of these challenges that we’re seeing now,” Stonier told the crowd. She also said the way cost of living was calculated in Southwest Washington didn’t take the Portland area into account, something she would like to see addressed. Cleveland said there is likely to be plenty of discussion in Olympia this session about education funding, but there’s a shortage of good information just yet about what the real problems are, and how to fix them. At least one question was asked at the town hall about what the state might to do address the impact of property tax increases to fully fund basic education. All three said they’re eager to talk more about ways to reform the state’s tax system to address revenue issues without pricing people out of their homes. 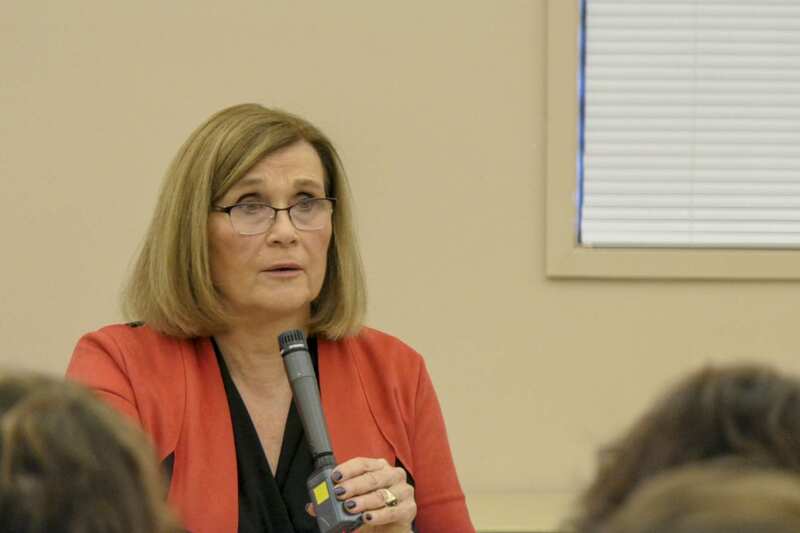 Sen. Cleveland said in her opening statement that getting funding for a new Interstate 5 Bridge project would be among her top priorities for the session. It is expected that a major transportation funding package will be among the major items to come out of this session. Among local projects looking for funding is a widening of SR-14 to Camas, and the Interstate Bridge. As for whether they would join the call by both Washington Gov. Jay Inslee and Oregon Gov. Kate Brown for light rail on any new I-5 Bridge, all three said that’s not really something they’re considering right now. Cleveland said her major focus is taking advantage of state funding to re-open an office to examine how much of the ill-fated Columbia River Crossing (CRC) project can be salvaged before moving ahead with new research. As for light rail, supporters have pushed for it, in part, because they believe it will help to secure more Federal funding. Cleveland said that may not be the case this time around. “Currently, with the Trump administration, light rail is not being made a funding priority in the way that it has been in the past,” she said, while noting that inclusion of light rail in the CRC’s preferred local alternative meant each state only needed to provide $450 million, with the Feds chipping in $850 million. One of the key talking points out of Gov. Jay Inslee’s budget was a public healthcare option. 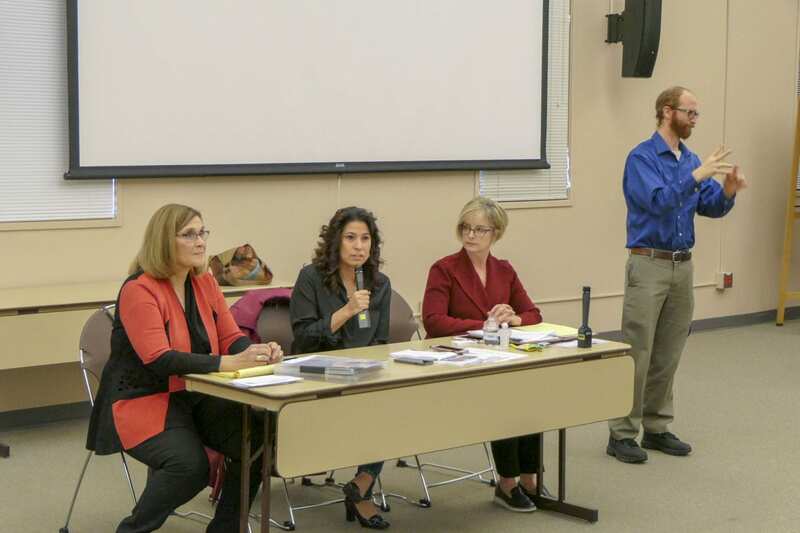 While all three 49th District lawmakers said they support the idea, and eventually would like to see single payer healthcare in Washington state, there are many questions to be asked about how to fund it sustainably. But the legislators also admitted that it could be an expensive future, requiring plenty of thought about how to pay for it. Vermont recently passed single payer healthcare legislation, but then had to shelve it after discovering it would have put the state in serious financial trouble. “They passed their bill without any sense of what the cost would be,” said Cleveland, noting that it would have required an 11.5 percent increase in payroll taxes, and 9 percent increase in income taxes. Stonier agreed, noting that the governor’s public option proposal could mark a good starting place toward that ultimate goal, adding that her primary goal this session is to address medicare reimbursements to increase access to medical care. “Whether or not we are able to move that legislation, I think that we’ll continue to look for places where we can increase access,” she said. The failure of I-1631 in November sent a clear message that Washington voters aren’t quite ready to see their gas prices and home energy costs jump in order to address climate change in the state. The proposed carbon tax was even criticized by many Democrats as being too hard on average citizens, while giving a pass to some of the state’s biggest polluters. But Gov. Inslee has proposed other items in his budget aimed at addressing the issue. Stonier agreed, but said she felt a 100 percent clean energy bill introduced at the end of the 2018 legislative session is a better way to address climate change without threatening jobs in the state. All three 49th District legislators said they agree with the governor’s goals, and are interested in having the conversation about how to get there. One question from a self-described “independent, moderate” voter centered around the current political climate, and extremes on both sides of the political aisle. The 49th District legislators all said they believe much of that stems from the way the media covers political stories. That topic was also part of a question about the legislator’s personal perspective on how they reach decisions, and whether it was ever acceptable to reject the will of the majority in deciding how to vote on a bill. “I’m not someone who puts their finger in the air and just listens to the loudest voice,” said Wylie, while adding that she takes input from both sides into account, along with her own personal beliefs, before making a decision. The trio was also asked for their thoughts on redistricting that favors keeping one party in power over another, also known as gerrymandering. “We have, probably, one of the least awful redistricting systems in the country,” responded Wylie. In Washington state redistricting is done by a mixed board of one Republican, one Democrat, and one Independent. As for what they plan to work on personally in the new session, Stonier said she’ll be focused on moving through legislation on portable benefits. It would make Washington state the first in the nation to make benefits follow the employee from one workplace to another, rather than the other way around. Stonier is also prime sponsoring a bill to allow school districts to get a building bond approved with a simple majority vote, rather than the currently required 60 percent, plus one vote. That would especially help districts like Battle Ground, which have repeatedly received majority support for building bonds, but fallen short of the threshold currently required. Wylie said she’ll be pushing for legislation that would allow people wanting to age in place to deduct certain medical expenses from their taxes. For instance, if someone needed to install a wheelchair ramp in order to remain in their home, the cost would be deductible. She also said she wants to take a close look at current state sales tax exemptions, to see if more equity can be implemented in the system.